"...Imagine all the people, living life in peace..."
Several times a year, Coexist Celebration Portland and Rev. Barry Dennis of Portland Oregon come alive on the stage and in the hearts and souls of people of all religions and faiths who come to co-create the experience in a celebration of spirit. From there it is taken out into our communities, our churches and our homes creating peace in our heart and mind. Each Celebration consists of soulful music, ceremony and the wisdom taken from all different religions and beliefs of the world. We invite Jews, Christians, Buddhists, Bahá'í, Hindus, Muslims, and other faiths of the world, to all be a part of each experience. Coexist Consciousness is an organic movement that has shown up out of a new consciousness arising on the planet. As the planet gets smaller everyday, we don't really have a choice....COEXIST or perish! The Celebration has been created to assist the Spirit from which it is arising. It has gotten our attention, now it is up to us to give it attention! The bumper sticker COEXIST got my attention. 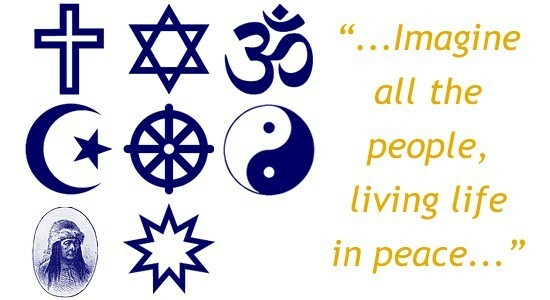 I say a little prayer every time I see it that the 'coexist consciousness' awaken on the planet. One day I suddenly imagined an event called Coexist Celebration where we could begin to help that happen right here and right now! If you have ever listened to the words in John Lennon's song, 'Imagine', it is like an anthem of the soul. I have often felt that it is the perfect song. His words are asking us to use our greatest power as co-creators with God, which is our imagination, to create a new world! It describes nothing short of Heaven on Earth. I want that new world for our children and our grandchildren. Can you imagine a world where war is a thing of the past, both outwardly and inwardly? The Pacific Northwest is the least 'churched' area in the country. Coexist Celebration Portland is a spiritual experience, NOT religious. All those people who have the Coexist bumper sticker, represent a thousand others who feel the same way, but have nowhere to foster and create that consciousness. Now they do! Can you see people of all religions, who love their traditions who go 'religiously' every Sunday to their community, becoming part of the larger interfaith spiritual community of Coexist Celebration Portland, gathering together with other people who would never consider going to anything called 'church'? ".....you may say I'm a dreamer, but I'm not the only one. I hope someday you will join us and the world will be as one..."